During all of 2015, I was out there, designing beautiful homes for my wonderful clients, teaching interior design classes at Temple University, experiencing amazing historic sites, being inspired by so many amazing design events, and of course, working on numerous personal projects as well. Hello everyone, it’s been awhile. I’m glad you’re joining me, once again, to usher in a fabulous new year! There are so many exciting things happening right now, and I’m eager to share them all with you. First of all, let me say that 2015 was a terrific year. I didn’t end up writing very many posts in the fourth quarter of last year, but that wasn’t because there was nothing going on. In fact, it was an extremely busy time! During all of 2015, I was out there, designing beautiful homes for my wonderful clients, teaching interior design classes at Temple University, experiencing amazing historic sites, being inspired by so many amazing design events, and of course, working on numerous personal projects as well. 2015 was, for me personally, the year of the Poconos. Many years ago, one of my favorite clients (and now a very dear friend) invited me to help with updating the design of her vacation home. The project was a beautiful success and an amazing transformation. The home went from dark, heavy 1970’s paneling and interiors, to bright, functional spaces, perfect for a little mountain get-away. Aside from helping with the renovations, my family enjoyed the luxury of visiting that cute little mountain cottage many, many times over the years, thanks to my generous friend. Eventually, my husband and I began to discuss the possibility of having our own small place in the mountains. We both grew up in the hills of West Virginia, just outside of Pittsburgh, PA, and the rugged beauty of the Pocono mountains just feels like home to us. We longed to visit the area more often and perhaps have a small place of our own to relax and share with our friends and family. 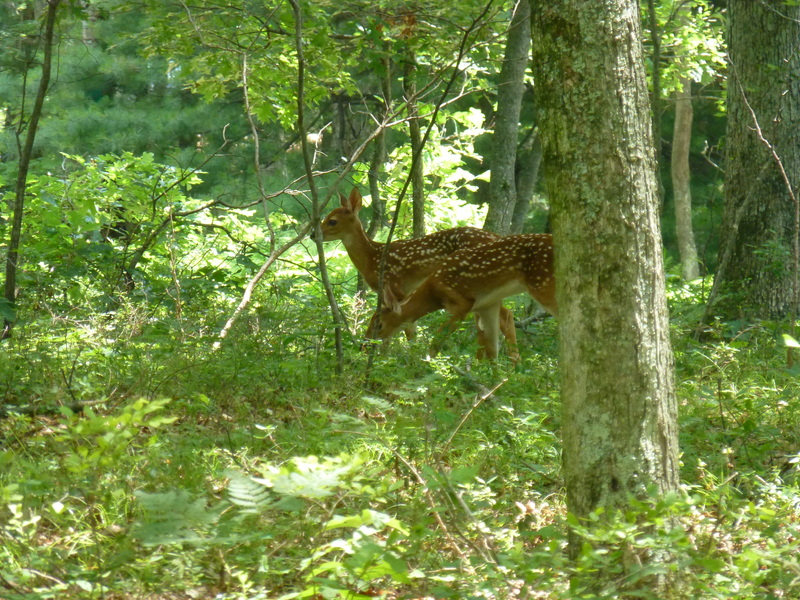 The Pocono Mountains, it’s nature and wildlife, remind us of the area of West Virginia where my husband and I grew up. 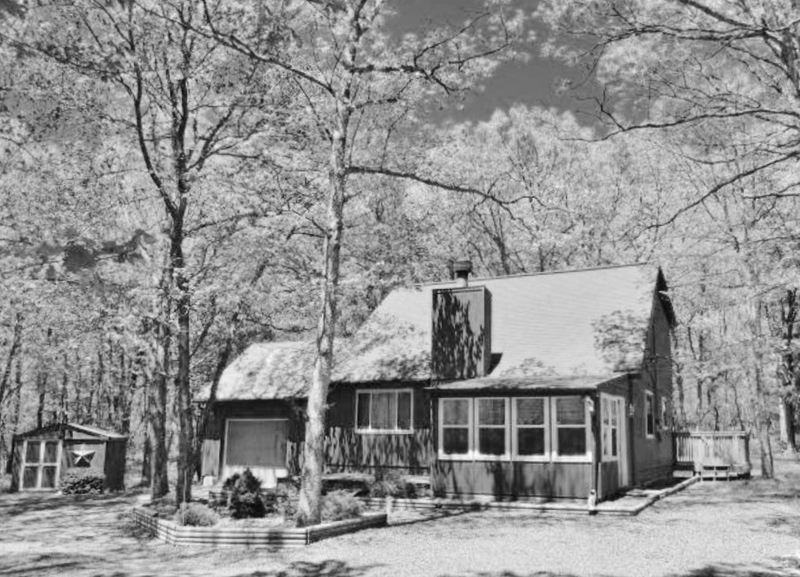 So, after scrimping and saving for a few years, and scoping out many spots in various parts of the Pocono Mountains, my family finally purchased a small fixer upper on about 1.5 acres of land in a lovely resort community with terrific amenities to enjoy. Our little ‘fixer upper’ which we are affectionately calling ‘The Shack’, sits nestled in the woods. It is a true fixer-upper, in every sense of the word, but we are enjoying the process and I’m eager to share it with you! Needless to say, purchasing a fixer upper as a vacation property has many challenges, so we’ve been super busy working on the house all year long. Many weekends, and vacation days, have been filled painting, sawing, exterminating, and spending a lot more money than we initially intended, on our little house in the woods. We’re still working on it, but are finally at a place where we can enjoy the space with friends and do some relaxing activities once in awhile. At any rate, I’ve finally decided we’re at a place where I can start sharing some of that process with you all–since we actually have some amazing before and after images of the process we’ve already gone through, and continue to experience. We’ve been doing a lot of the work on ‘The Shack’ ourselves and there is still a lot to be done! 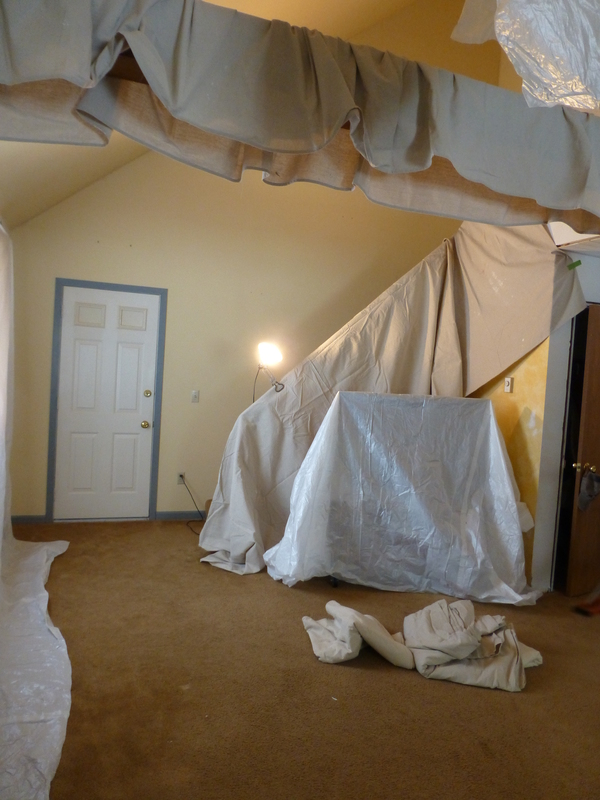 Here, you see our preparations for painting the vaulted living area, with it’s nasty old carpeting, unsightly plastic shell door-casing and completely dated interiors. The yellow sponge-painted walls are now, thankfully, a thing of the past, and we’ve been making much needed upgrades to every area of the little house. On another personal note, our family has increased by one in 2015. My husband, Eric, and I celebrated our 25th wedding anniversary (I can’t believe we’ve enjoyed each other’s company for so many years) and decided a fitting gift to one another would be making the long-term commitment of a new pet. 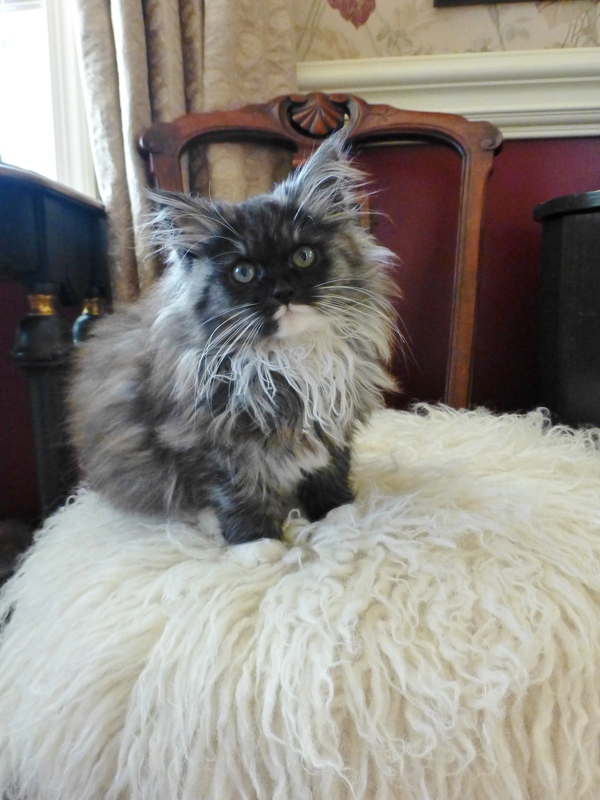 Silvia (named for our Silver Anniversary), the Siberian Kitten, joined our household in the first week of November. She’s so cute, and loveable, and super playful, and already the Robinsons can’t imagine life without her! 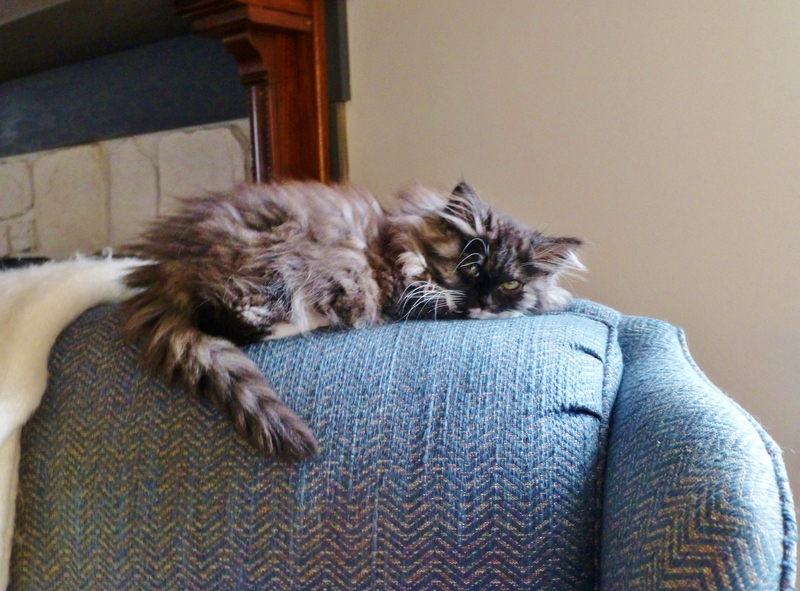 Silvia, the Siberian Kitten, enjoys a favorite perch in the sunshine at ‘The Shack’. Silvia is a Siberian Kitten. This breed is considered Hypo-Allergenic and I can attest to that fact. We experience absolutely no allergy symptoms while snuggling with this adorable creature. She’s the best!! So, to sum up this post, in 2016 you’ll be hearing more about ‘The Shack’ in the Poconos, and possibly a picture or two of my adorable kitten, Silvia. You’ll definitely be seeing more of my excursions to fabulous designer houses, historic sites, beautiful gardens, and of course, hearing more about my work as an interior designer. Plus, I have a big announcement to make very soon! You won’t want to miss any of the exciting year ahead. Thanks for being my friends, clients, and loyal readers. Until next time, feel free to share my posts and images on Pinterest and social media, and please share my blog with others. I absolutely love making new friends! Robinson Interiors information and contact info. This entry was posted in Decorating, Home Decor, Interior Design, New Year, Robinson Interiors and tagged 2016, 25th Wedding Anniversary, Fixer Upper, Kitten, Kristine Robinson, Pet, Poconos, Siberian Kitten, Silver Wedding Anniversary, The Shack, Vacation Home. Bookmark the permalink. Hi Kristine, I received your e-mail and your “Shack” looks adorable and beautiful with the snow. Of course your cat is gorgeous and very sweet looking. I know when you finish your vacation house it will be beautiful. I remember our 25th anniversary, it was just yesterday and now this summer we will be married 54yrs. It is amazing. Much more happiness to both of you and your family.